Last January, Ms. Tran Thi Hong – Technical Officer of Transaction Office 02 – TYM Bac Ninh Branch was honored as one of the six outstanding credit officers in the Asia – Pacific region under the Whole Planet Foundation Field Officer Appreciation Award. The WPF Field Officer Appreciation Award is organized annually to honor the credit officers currently working at MFIs who not only have outstanding achievements in their works but also are the outstanding example of dedication to the mission of poverty reduction. Ms. Tran Thi Hong is the 5th officer of TYM to receive this Award. Once deciding to participate the WPF Field Officer Appreciation Award, it is always a hard job for us to select the suitable nomination because every TYM’s credit officers nominated by each branch are all with good and outstanding achievements. In 2018, with nearly 300 credit officers working across branches, if we only depend on the work performance, almost every field officers deserves to be nominated. 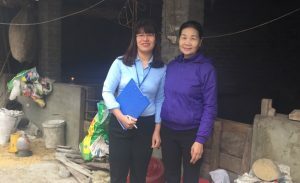 For Ms. Tran Thi Hong – Technical Officer (credit officer) at Bac Ninh Branch, in addition to the outstanding work achievements, we selected her for her own personal development progress and maturity, innovative capacity and dedication for the poor since she became a credit officer at TYM. It has been 10 years since the young girl Tran Thi Hong interviewed to work at TYM. The working environment of interacting with many people, especially the poor and near-poor brought her many challenges in the early days. “When I was interviewing to work at TYM, I still remembered one of the interviewers, Mr. Sy – Director of Soc Son branch evaluated that I was so shy and uncommunicative”. As a young and fresh graduation girl of only 22 years old just entering a completely different working environment, she found herself shy, lack of confidence as well as lack of soft skills. The first time she had a community meeting, acknowledging her own weak points, she carefully prepared and practiced the presentation at home. Yet, when she had to speak at the meeting, her heart beat again and again, her face flushed and she forgot everything she had learned before. She found out that if this situation lasted long, she was unable to convince the community to join and benefit TYM’s products and services. Ms. Hong understood that and did not stop training herself to improve her communication skills and overcome her limitations. Under the dedicated guidance of colleagues and regular training courses of TYM, Ms. Hong has been eager to learn. From time to time, she has become more confident as well as flexibly resolving tasks. She always has a creative way of communication to the communities. She understands her members and always finds the most appropriate and understandable explanations for members. The average distance of more than 45 km from her house to the office burns her a lot of time to travel. Nevertheless, besides the daily tasks, she always tries to take a good care of her 602 members. With the motto of “TYM staff needs to share sadness and joy with members, keep solidarity”, Ms. Hong is always close to and trusted by members. All of her efforts have been reflected in her work results. Ms. Hong is always ranked as Excellent in all quarters. The number of members, that she is serving currently, is nearly 11% higher than the caseload. Her savings exceeded 70% of the target and the loan outstanding exceeded 50% of the target. In addition, the centers, that she manages, are all recognized as strong center for consecutive years and remain excellent portfolio quality. Many members have grown up with more stable income. Remarkably, 87 of her members have escaped from poverty sustainably; one member grew from an ordinary member of the Vietnam Women’s Union to the vice chairwoman of the commune women’s union (Mrs. Hoang Thi Hanh at center no. 9, Lien Ha village, Dai Xuan commune, Que Vo district). One special member that Mrs. Hong helped is Mrs. Nguyen Thi Duc. Her family was under poverty line, her husband is paralyzed due to cerebral vascular accident and he can only lie at his bed. To make living, Mrs. Duc has to catch snail which is very hard work and had no time to take care of her husband. 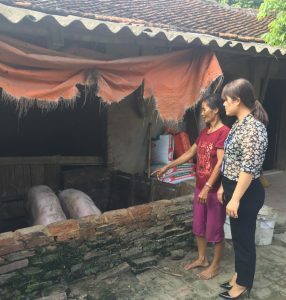 Mrs. Hong encouraged Mrs. Duc to borrow a loan of VND 10 million to raise pigs and chickens. Mrs. Hong also introduced her to work in the sanitation cooperative with the salary of VND 5 million per month. Thanks to this job, she has enough time to look after her husband, and this job stabilized her family’s life. Her family has escaped poverty and is now leading a much better life. We believe Mrs. Hong’s efforts, contributions to the overall result of TYM are a fire that illuminates the passion for the work of other members of TYM and contributes to the creation of a strong microfinance institution. With the above achievements, Ms. Hong is a role model for TYM’s young staff in the effort to rise up in her work performance as well as transfer love for their work. She was recognized by the Youth Union as an active member in the emulation movement. Ms Hong contributes positive energy and creates solidarity for her staff and her members. Wherever Mrs. Hong goes, she makes her everyone more enthusiastic, happy, encouraged and more productive and creative with their work. “In life, I always try our best to be better and to help many disadvantaged people. In works, I always strive for the development of the whole organization, not for personal purposes”.